Welcome to another addition of What's Momma Makin'! Another family favorite are potatoes au gratin. 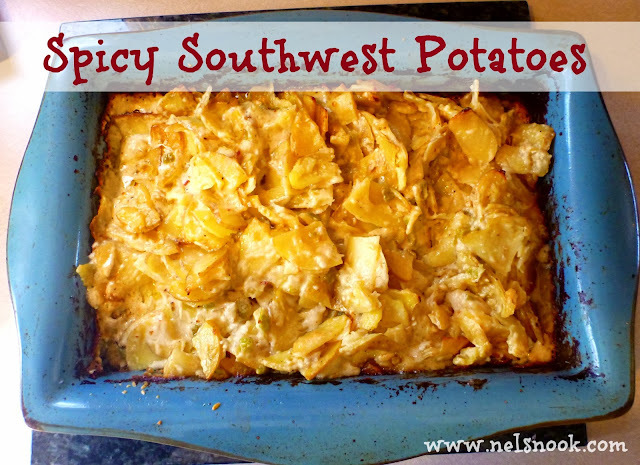 This version have a spicy twist to them, thanks to Aunt Laura’s creative cooking, she used to call them Southwest potatoes. Laura was an incredibly amazing woman and a fabulous cook, I will be making a few of her signature recipes this fall, classic home grown comfort food and mouth watering holiday magic, wait until you get a taste of her Thanksgiving sausage dressing! When my husband Jeff’s side of the family gets together, there are certain foods that are “must haves” for a dinner to be officially complete; these potatoes are one of those favs. Several years back, I brought them to a dinner at my parent’s house, they were gone in record time! They are super easy to make, can be doubled or tripled for a crowd, the left overs are phenomenal, and they go great with any main course. Enjoy!! Preheat oven to 350 degrees, grease an oblong baking dish, and set aside. In a medium-mixing bowl, combine Cream, garlic, chilies, salt, pepper and red pepper flakes, mix well. Alternately layer potatoes, Parmesan cheese and the liquid mixture in greased baking dish, finishing the layers with the last of the liquid. Cover and bake for 2 hours or until potatoes are tender, stirring occasionally to coat all potatoes evenly. Remove cover in the last 10 to 15 minutes of baking to brown up the potatoes. Additional milk can be added if the potatoes seem dry, salt and pepper to taste, serve hot. A whole pint of cream? How could they not be good? Thanks for sharing this recipe. These potatoes sound awesome! I do have to say, they are amazing, but I am all about making a recipe your own, I always do! For company or special occasions I use the regular recipe but I have made these using half cream/half milk and they are very tasty, just not as creamy. Experiment away and enjoy!